Me: Hey sweetie, what would you like for Christmas (Father's Day, birthday, etc etc etc)? Rob: Nothing. I don't need anything. I rack my brain forever and then go buy something I think he'll love. Rob: Actually, can you get me this (insert some random electrical circut thing I've never heard of)? So if your husband or significant other doesn't happen to be wishing for an FPGA or a 3D Printer, here are a few other ideas that have worked with Rob in the past. Kobo or Kindle - I'm a Kobo girl myself, but I prefer the Kobo only because I can get books from our library on the Kobo. Rob enjoys his Kindle. He really wasn't much of a reader when we first started dating, but he really reads so much more with his Kindle. If you want to pre-load a good book to go with it, Rob recommends Chris Hadfield's An Astronaut's Guide to Life on Earth. 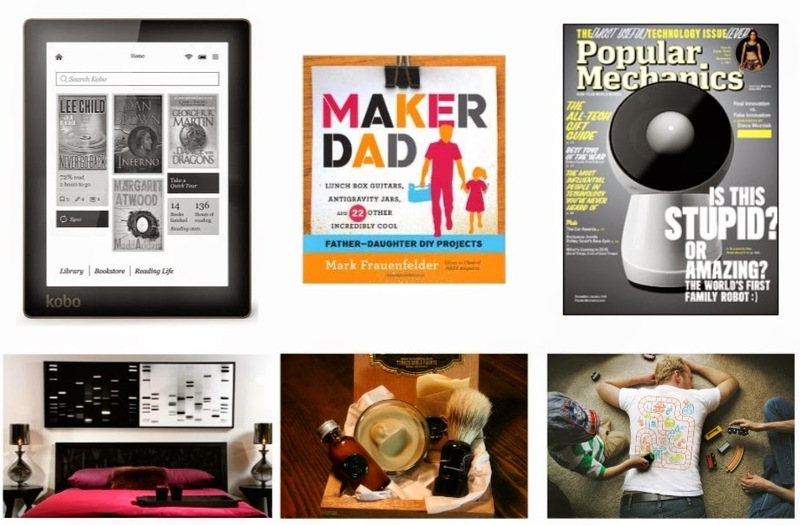 Maker Dad: Lunch Box Guitars, Antigravity Jars, and 22 Other Incredibly Cool Father-Daughter DIY Projects by Mark Frauenfelder - I nearly bought this book for Rob for Christmas before I saw that it is for father-daughter projects. Maker-ism (is that a word?) is big in our house, or at least it's big with my husband and we both hope Seb loves it too. I haven't yet gotten my hands on a copy of this book, but it looks freaking awesome. I really would like to see if the projects could be gender-neutral. Popular Mechanics Subscription - This has been my mom's go to gift for Rob for the past few years. She's actually gotten him a subscription to the cleverly-named Nuts and Volts, but Popular Mechanics also comes highly recommended by many of the men I know. DNA Canvas Portraits by DNA 11- By far and away the coolest art piece in our house. I gifted Rob this as my wedding gift to him, and now our DNA hangs in our living room. Eco Friendly Shaving Kit by Orange Fuzz - Rob LOVES this shaving kit. It's full of all-natural products and comes in an upcycled wood cigar box. I've also gifted it to my brother-in-law and his partner. My brother-in-law told me his partner downed both kits quickly. Trust me, the Guinness Cedarwood Beer Soap smells amazing. Train Play Mat T-shirt - So I actually haven't gifted this to Rob yet, but this shirt makes me laugh...and question my parenting....and want one so so bad.